Please join us as Justice Hantz Marconi shares her thoughts on her legal career, her pre-legal career, the process of becoming a NH Supreme Court justice and what it is like to serve on the state’s highest court. 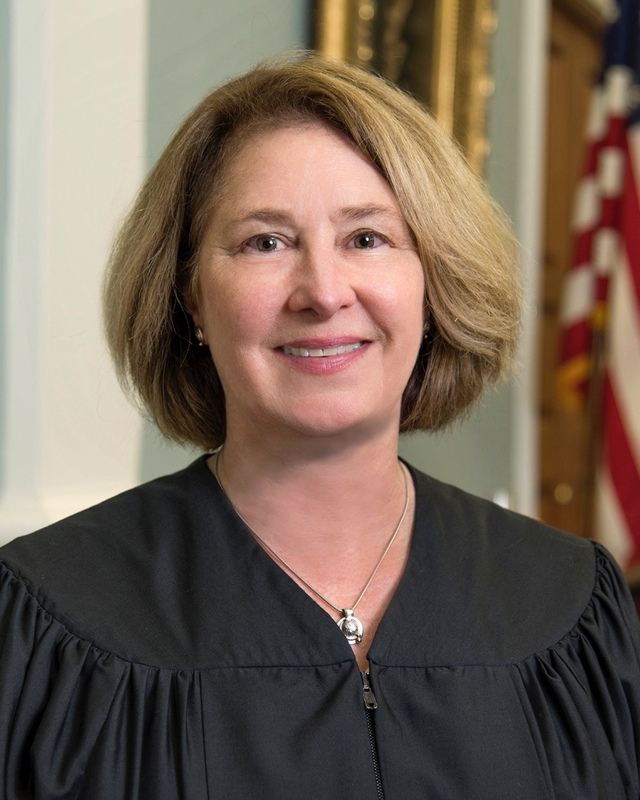 Anna Barbara “Bobbie” Hantz Marconi is the 108th Associate Justice on the New Hampshire Supreme Court. Following her confirmation by the Executive Council, she was sworn in by Governor Christopher Sununu on August 8, 2017. Justice Hantz Marconi is only the third woman to sit on the state’s highest court. Hantz Marconi joins the court from private practice as a shareholder with the Manchester law firm of Sheehan, Phinney, Bass & Green. There, her concentration included appellate litigation, business litigation, land use, mediation, probate and family law. At Sheehan Phinney, she gained the reputation as a problem solver. Her work on key cases set new legal standards for zoning appeals and established privacy standards for internet information. She graduated with honors from the University of New Hampshire with a B.A. in Political Science and received her Juris Doctorate from The Chicago Kent College of Law where she was member of the Order of the Coif. Following law school, she clerked for the Maine Supreme Judicial Court. Hantz Marconi has been honored as one of the “Best Lawyers in America” for Family Law, was nominated for the Nashua YWCA’s Distinguished Women Leader Award, received the Special Recognition Award from the NH Trial Lawyers and has been recognized as the Women’s Business Boston Reader’s Choice “Top Ten Lawyers”. Her volunteer work and civic involvement include the NH Bar Pro Bono Referral Program, the Domestic Violence Emergency (DOVE) Program, the NH Board of Bar Examiners, the NH Women’s Bar Association’s Marilla Ricker Awards Committee, the Manchester Community Music School, the Nashua Children’s Home and the Josiah Bartlett Center where she served as vice-chair. Justice Hantz Marconi is also a past board member with NH Legal Assistance and the Governor’s Judicial Selection Commission. Hantz Marconi lives in Stratham with her husband Geno Marconi.